Manfrotto introduces our new 190go! This model completes the advanced hobbyist and professional offerings with a more compact and easy to transport version of the successful 190 tripod. The new 190go! 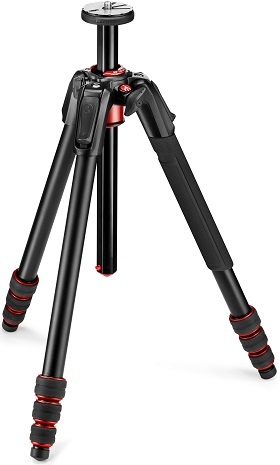 is the lightest and most compact aluminum tripod in the 190 product range. With a closed size of just 17.7 and weight of 3.75 lbs, this is 1.6 more compact and 20% lighter than the MT190XPRO4. The 90column mechanism is hidden inside the tripods top casting until its needed; the mechanism can then be raised with a single finger, allowing the centre column to swing to the horizontal position. Together, the 90column and the 4 leg angles enable you to get low down to the ground like no other tripod.